Former Education Minister and co-organizer of the #BringBackOurGirls campaign, Obiageli Ezekwesili has been selected for the Nobel Peace Prize in 2018 by the PRIO Institute for Peace Research. 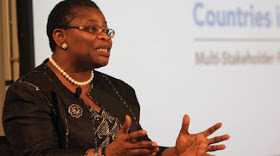 Ezekwesili, who is also former Vice President of the World Bank and International Transparency for Extractive Industries (EITI), and will compete with four other winners (Dr. Denis Mukwege, Nadia Murad & Tarana Burke for the World Food Program). SOS Méditerranée, Médecins Sans Frontières and the International Rescue Board and Reporters Without Borders) has voiced its voice on the campaign, including Leah Sharibu, who is still being held captive.